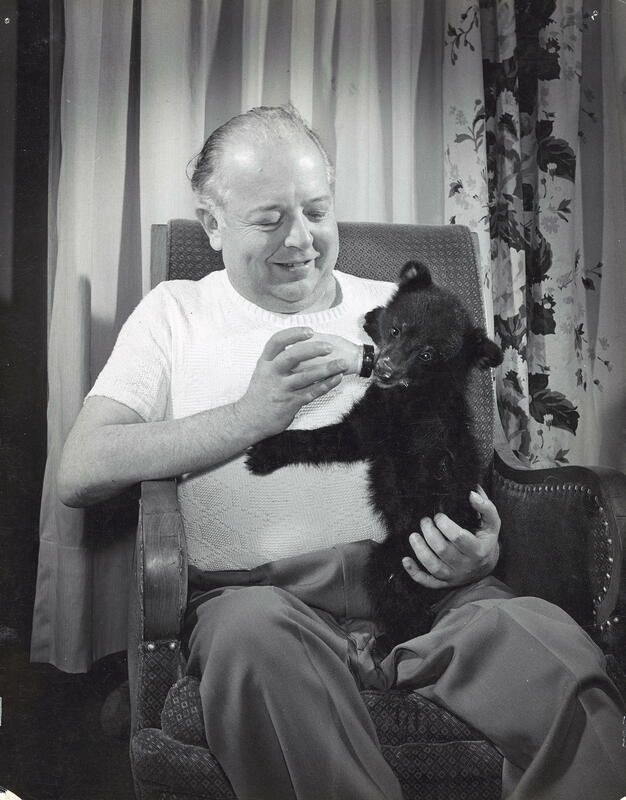 Carl Marty was famous for befriending wild animals at the Northernaire. It was one of those quirky, rare moments when the convergence of the right place and the right time coalesce into an indelible memory. I was a senior in high school at the time and it was the week between Christmas and New Year’s, 1978. My parents and I headed north to Eagle River to meet with family for a few day of cross country skiing. On one of these days Mom and Dad had a little sightseeing in mind, they wanted to find a place called the Northernaire. As I pieced together the story during the drive to Three Lakes, in northeast Oneida County, I learned that this Northernaire was nothing short of the “Waldorf of the Wilderness.” A golden, gleaming luxury resort with gourmet chefs, a grand ballroom, and entertainment that rivaled Las Vegas. My parents had never stayed at the Northernaire but apparently had eaten dinner there once many years before and had soaked in enough of the ambience of the place to create larger than life memories that still held fast. Surprisingly that winter afternoon our car was about the only one in the lot. Although it was a prize week for northern tourism. Sitting down for lunch in the Northernaire’s big dining room, we seemed to be the only ones there too, except for an old man sitting by himself at the opposite end of the room. Then the waitress offered us an invitation on behalf of Mr. Marty to watch some wildlife films. .
We were led to a downstairs room where we found the old man I had seen in the dining room, Carl O. Marty Jr. himself, the founder and proprietor of the Northernaire. At that time Marty was nearly 80 years old. I didn’t realize until many years later that I was playing witness to the end of a special chapter of the Northwoods resort industry. After learning more about Carl Marty and his vision of a resort unlike any the north had ever seen, I realized that the Northernaire of my parent’s memories truly had been something special. But that special place, the reality of the Northernaire as the Waldorf of the Wilderness, existed in a different time—the 40s, 50s and 60s but by 1978, that time was nearly gone. Carl Marty was a Wisconsin resort visionary. Earlier in his life he was a cheese maker and had already made a fortune in the cheese production business when he sold out 1939. With money in the bank and help from his younger brother Bob, Carl decided to act upon a dream he had of developing the perfect luxury resort. Marty knew precisely the type of customer he was after, the more affluent post War veterans and their baby boomer children. His resort would be a departure from tradition. He realized that people desired the same comforts, conveniences and luxuries of their town life even while on vacation. Marty would place his luxury resort in the heart of the Northwoods, on land his father had purchased in 1915 on Deer Lake. The construction of the Northernaire began in 1946, with the resort formally opening in 1947. Marty’s timing for a new kind of Northwoods resort could not have been better. Oneida County and other north Wisconsin resort destinations were poised for exceptional growth in the post war era. Whether it was pure business savvy or some unexplained intuition, the Marty brothers had hit the mark with their vision of the clientele they wanted to attract to the Northernaire. The Waldorf of the Wilderness quickly drew celebrities and other well-heeled tourists. In July of 1947 Gypsy Rose Lee, the famous burlesque stripper and actress made her second visit to the Northernaire. But even more important than celebrities and high class amenities to the lore and legend of the Northernaire were Carl Marty’s adopted woodland orphans..
Before construction of the resort Marty and his cocker spaniel Rusty had a brief close encounter with a wild red fox while walking the Deer Lake property. The incident inspired Marty to experiment with taming wild animals and letting them interact with his domestic pets. Marty started with red fox pups, taming them enough to where they bonded with Rusty. As they grew the fox were given their freedom but seemed to retain an affinity for the spaniel and retuned from the woods on numerous visits. The experience with the fox rekindled Marty’s youthful love of wildlife, and wild animals soon became a central focus at the Northernaire. The fox experiment led to deer fawns, and eventually to beaver, porcupines, pine marten, and coyotes. Ginger, a daughter of Rusty, along with a St. Bernard named Bernese, became famous as the dogs that not only bonded with the wild orphans but mothered, protected and formed lasting relationships with them. With a protectionist outlook on wild animals, Carl Marty was not the best friend of the local hunters and trappers. The Northernaire as a business entity, however, was not anti-animal use by any means. Aside from all of the many activities the Northernaire offered, fishing was still important to many of the guests, including Gypsy Rose Lee. Marty died in 1979 at the age of 80, a year after my parents and I joined him for wildlife films that winter day. After Marty died, the resort passed through a series of owners, including Fred Schlagel, who worked to keep the hotel’s reputation for world class entertainment alive. Schlagel booked Bob Hope in 1983. Hope’s sold out appearance under a big tent on a sweltering hot August night may have marked the end of the grand resort’s attempt to retain the glory of years past. The rest of the world, or at least the North Woods resort industry, was catching up to Carl Marty’s vision and by the late 80s and early 90s fancy new resorts and condominium developments were appearing on a regular basis on prime northern lakes. The Northernaire was still in operation, but just barely it seemed, when my wife and I stopped there in the summer of 1990. We had just moved to Rhinelander and my own memory of the Northernaire and Carl Marty, that odd winter day in 1978, prompted me to take her there one Saturday afternoon. We had hoped to eat lunch there in the big dining room but were informed that the Northernaire no longer offered lunch, just dinner. Soon after, the Northernaire was closed by bankruptcy and stood silent and vacant overlooking Deer Lake for several years. Unprotected, the inside was vandalized, the dining room destroyed. Finally, Carl Marty’s dream vanished from the face of the earth as the Wisconsin North Woods eased towards the summer of 1996.. The injured Northernaire was demolished in May by new owners who hoped to build a new hotel and condominium units at the site. The ‘Waldorf of the Wilderness,’ was no more. Wisconsin’s gun deer season is approaching. It’s a time when many hunters across the state look forward to getting away from the pressures of work, spending time in the woods. But as WXPR’s Bob Willging relates in today’s History Afield essay, the 1942 murder of a conservation warden in Florence County had deer hunters in northeast Wisconsin anything but relaxed. In the autumn of 1942, America was becoming deeply involved in World War II. We’re heading into November, and that means deer hunting will soon be in full swing. It’s a cultural phenomenon in the state, with deeply rooted traditions that go back 100 years or more. While there has been much change in Wisconsin deer hunting over time, controversy and disagreement have never been far away. In the first of a series we’re calling History Afield, WXPR Contributor Bob Willging has the story of one of the oddest deer hunting political battles of the last century.